Andy Ockershausen: Our Town, Thanksgiving 2017. Janice Ockershausen and I want to take this time to thank all of those who have made this podcast so special. To name names, like Bill Brower from GEICO, who is our underwriter. Thank you to Ken Hunter, technical director par excellence, and image director JJ Surma. To the staff at WMLA Radio. To our Best Bark communications producer Stephanie Colli, and especially to Rose Caplan, our operations manager. It seems like it does take a village, Janice Ockershausen. Janice Iacona Ockershausen:	Yes it does, as quoted by Hillary Clinton. Andy Ockershausen:	Our first anniversary with September, and with over 125 interviews under our belt, and 50 more to come at least, we have thousands and thousands of people listening. It’s been unbelievable to me how this listenership has taken off. It’s been a great experience for us to catch up with old friends, and to make new relationships with the incoming leadership of Our Town. Janice Iacona Ockershausen:	Season 3 is going to be a great surprise. We have a lot of new faces in town that we’re welcoming, that you’ll easily identify with. Andy Ockershausen:	Yeah, but we got the old ones too. That’s what makes this whole effort so great to both of us. We grew up, a lot of these names, and a lot of these names we didn’t even know until we brought them into Our Town. It’s been remarkable to both of us, the feedback we get from you. What you listen to, and what you like, and don’t like about what we’re doing, and who you like to hear from. You speak up, and that’s what makes this podcast so special. We’ve tried to present an interesting collection of Washingtonians who have touched our lives in one way or another, through their presence in sports, news, government, or the arts. Most of all, at this time of Thanksgiving, we’re very grateful for the opportunity to say thank you for listening. For commenting, for suggesting, and for the rave reviews, and ratings that we’ve been receiving. 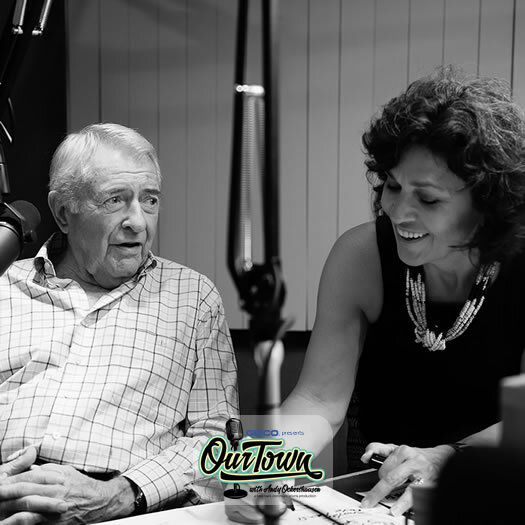 Janice Iacona Ockershausen:	While you’re making your turkey at the holiday season, make sure you catch up on all episodes of Our Town. You can share it with the people that maybe are revisiting the DC area, or new family members that you’d like to turn onto. It’s a great opportunity when you’re driving, on your long drive and all the traffic, to listen to the podcast through your Bluetooth system on your car radio. Or traveling in an airplane. Our Town is available really, in any type of distribution. Andy Ockershausen:	One of the things that surprised me, that you’ve taught me Janny Ockershausen, is the fact that it’s so different than radio. We don’t have any blank spots. You never lose the signal from Our Town. It’s with you all the time. Thanksgiving, while you’re working, we have some turkeys we want you to listen to too, so please try to tune us in. When it’s over, keep the cards and letters coming. That’s more important. The review and that we’re hearing from you, is more important than any rating we could get. Andy Ockershausen:	We’re just here to serve you. It’s been such a great experience for us that grew up in radio, at this wonderful radio station that we’re working at now, we just think it’s been a great Thanksgiving. Janice Iacona Ockershausen:	We have a lot to be thankful for. Andy Ockershausen:	Don’t forget, now when Thanksgiving is over, we start right again to work on Christmas. We’ll be here for you, 24/7. That’s the great part about our podcast. It’s always there. Janice Iacona Ockershausen:	Remember, Season 3 starts December 5th. Visit OurTownDC.com. Andy Ockershausen:	Even if you don’t like our podcast, and don’t think what we do is special, have a happy Thanksgiving anyway. Remember the old expression, nobody doesn’t like Sara Lee. Well, nobody doesn’t like Our Town. Janice Iacona Ockershausen:	Happy Thanksgiving from your friends at Our Town. Announcer:	You’ve been listening to Our Town, Season 3, presented by GEICO. Our home town favorite, with your host, Andy Ockershausen. New Our Town episodes are released each Tuesday and Thursday. Drop us a line with your comments or suggestions. See us on Facebook, or visit our website at ourtowndc.com. Our special thanks to Ken Hunter, our technical director, and WMAL Radio in Washington D.C, for hosting our podcast, and thanks to GEICO. Fifteen minutes can save you fifteen percent or more on car insurance.